In Asia Minor, sometime around the year 55 of our era, a baby was born; he was soon afterwards sold into slavery, taken to Rome, and given the name Epictetus (Ἐπίκτητος). He couldn't walk, so his master sent him to learn to read and write instead; he thrived in academia and ended up as one of the foremost philosophers of his age. Eventually his master freed him, and Epictetus set up his own philosophy school. 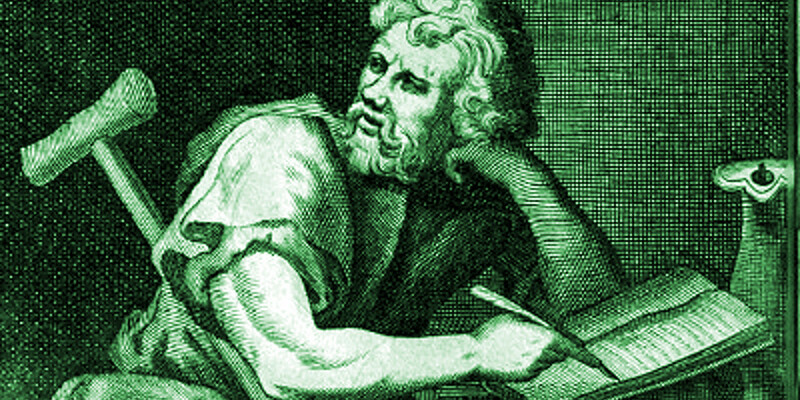 Epictetus was a Stoic: that is, he believed the important thing in life is to learn to act and react appropriately. You can't expect to be fully in control of your possessions or your body, and you certainly can't expect to control other people, but you can learn to be more in control of your own mind and your own reactions. For example, suppose you're a tennis player; however hard you train, you might never win at Wimbledon, because of things you can't control: luck, the weather, the performances of other players. But being the best tennis player you can be is within your control, so it's a more appropriate goal to aim for. If you do manage to learn to react to everything that happens in the most appropriate manner for that thing, Epictetus says you will have achieved happiness (εὐδαιμονία, eudaemonia, "good-spiritedness"). We don't have any of Epictetus's own writings. But Arrian, one of his pupils, wrote up his lecture notes in eight books called the "Discourses", four of which have come down to us; he also produced a short summary often called the "Enchiridion", which simply means "handbook". That's a good place to start reading. There are several good translations; the one at the link was written by the rather wonderful Elizabeth Carter (1717-1806). Many people have learned from Epictetus's ideas in the last two thousand years, but perhaps one of the most surprising is the second-century Roman emperor Marcus Aurelius, himself no mean philosopher; though they never met, the emperor cited Epictetus's influence repeatedly in his writings. In around a hundred years, Epictetus had gone from slavery to being the teacher of the emperor of Rome.